During the last year, I have been learning historic and alternative photographic processes. 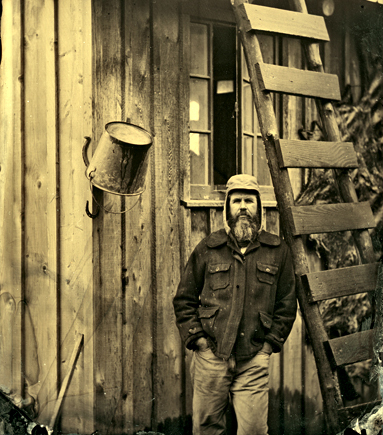 This May I participated in a wet plate collodion workshop with John Coffer on his farm – Camp Tintype – in Dundee, NY. Coffer is a master wet plate photographer and is widely credited with helping to revive this labor intensive and beautiful process in an era that is overwhelmingly digital. Collodion was first used in photography in 1851 by Frederick Scott Archer. He found the composition of collodion – nitrocellulose, ether and alcohol – to be ideal for suspending silver nitrate on a glass plate and allowing a latent image to form when exposed to light. 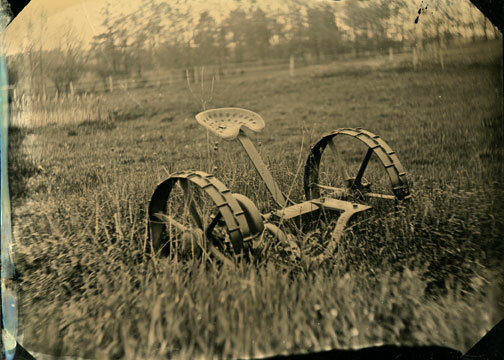 Wet plate was the primary photographic process in use until the early 1880s, when commercially produced dry plates became the standard. Coffer’s intensive three-day workshops, limited to four students, are geared to photographers who want to make glass negative images in the field, as Mathew Brady’s photographers did during the Civil War, in addition to other plate types derived from the original collodion process: positives (ambrotypes) and tintypes (ferrotypes). The workshop also includes an overview of historic cameras and lenses, the chemistry associated with the wet plate process and methods for albumen printing, the primary photographic printing process of the late 19th century. In the wet plate process, collodion is poured (flowed) onto a plate of glass or tin; and the solvents must be allowed to evaporate enough to form a slight “skin.” Then the plate is taken into the darkbox and immersed in a bath of silver nitrate. Haloids in the silver nitrate will adhere to the collodion and render the plate light sensitive and ready for exposure. The sensitized plate must be placed in a light proof holder and attached to to the back of an an already positioned and focused view camera. The exposure is made by removing a metal insert from the plate holder and then – for those working with period lenses – removing the lens cap, allowing light to strike the plate. Exposure times are measured in seconds and, in some cases, minutes. After the exposure is made, the plate must be developed in the darkbox within a matter a few minutes to produce an image. The plate is then rinsed, fixed with sodium thiosulfite or potassium cyanide, washed and put in a rack to dry. As a protective measure, a finished plate should be varnished with sandrac varnish, which is flowed in the same manner as collodion. The plate should be heated until hot to the touch; and the historically correct method would be to heat the plate over a kerosene lantern. Holding the plate over a high wattage hairdryer will also server the puropse. Since John’s workshop, I have been gathering all of the equipment and chemistry I will need for long-term use in wet plate photography. Aside from camera and lenses, for which I am still in the market, the most basic choice that remains is what type of darkbox design to use. 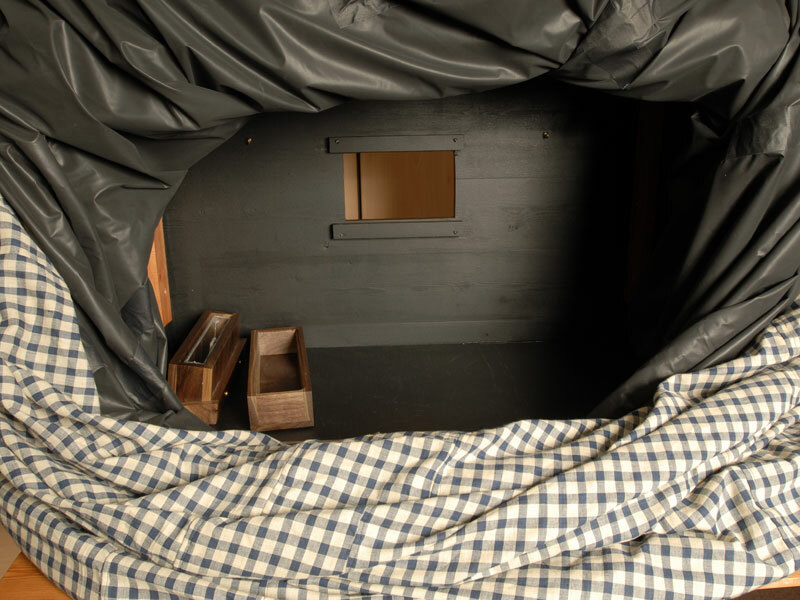 There are many different and innovative approaches to constructing darkboxes for field use. Some wet plate artists who work in very large plate sizes have gone so far as to retro fit a horse van with all of the amenities they need (it will be a long time before I contemplate such a scale). Others have made darkboxes out of gatorboard or even cardboard. It need not be elaborate as long as it is light-tight and provides ample working room. 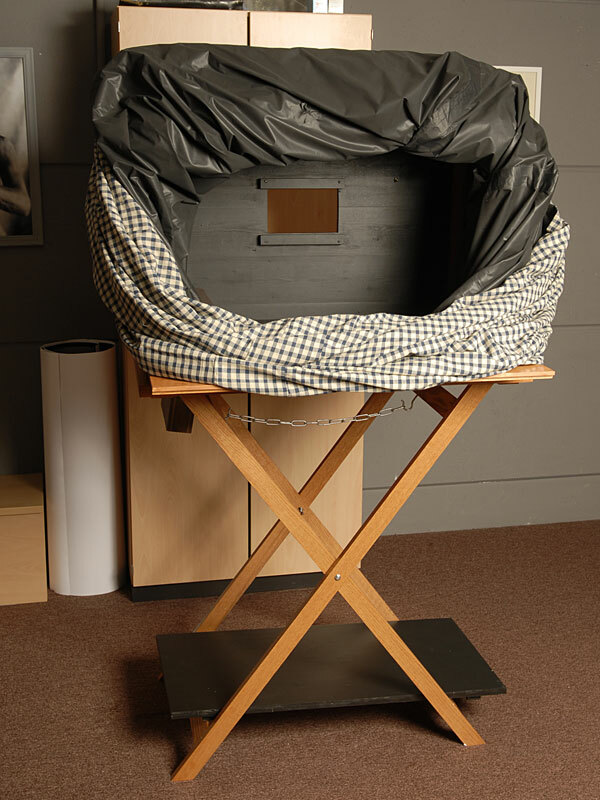 Quinn Jacobson has recommended a wet plate photographer in Rochester, Steve Silipigni, who makes a custom darkbox mounted on a table stand with a sunken silver nitrate box (photos below); and I have decided to order one from him.